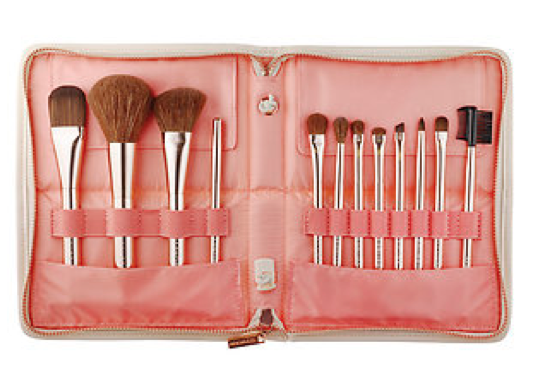 The holiday season is the *perfect* time to buy a makeup brush set or even a special makeup brush. 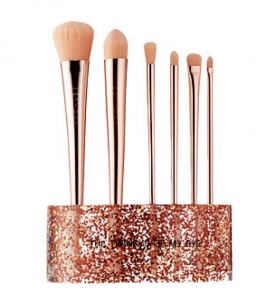 I encourage you to check out our list of 2015 limited edition makeup brush sets at this link, as well as our Best of the Best makeup brush sets of all time. 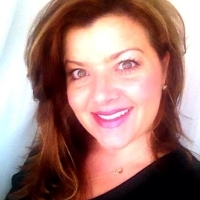 Those are makeup brush sets around year round that are all time favorites with top reviews. 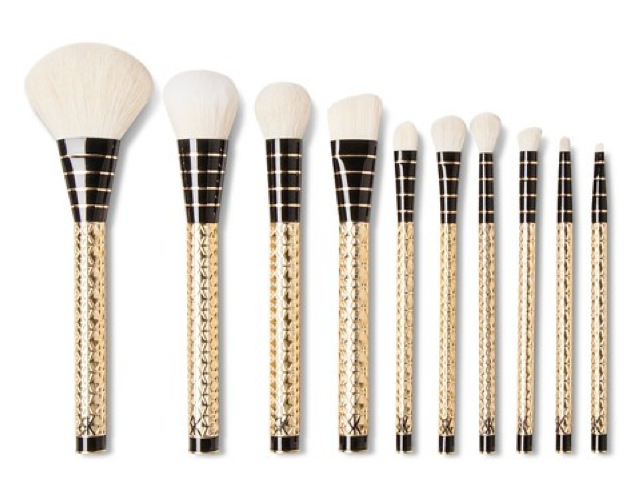 Today, we’re here to talk Black Friday makeup brushes for 2015. And, turns out, most of the good ones are at Sephora this year. Pros: It’s very pretty. Heck, it even matches the color scheme of this blog! It comes with 11 brushes plus a brow-spoolie. Cons: Contrary to the name, these brushes don’t actually stand up. The “stand up” in the pouch that stands when open like a book. … The powder brush doesn’t look like it offers much control. While the website says this is made with “cruelty-free fibers,” there’s no additional information, so who knows how true that is. Also, a few of the reviewers complained the packaging gave off an intense plastic smell. 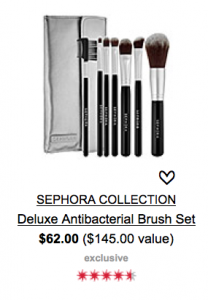 All this said, we think the best brush set to give as a gift at Sephora is one that’s on our Top 10 Makeup Brush Sets list, the Deluxe Antibacterial Brush Set for $62. 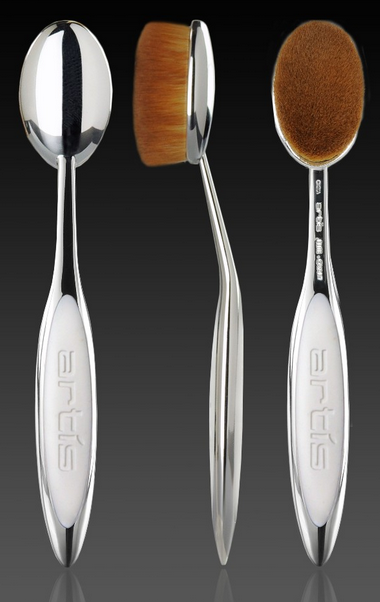 Now, the packaging isn’t as cute, but it’s a mainstay of Sephora’s brush line and it’s durably popular for a reason. 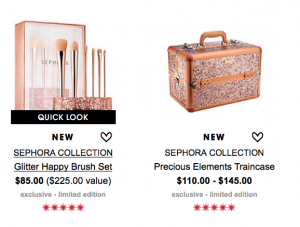 The Sephora Collection Glitter Happy Brush Set, for $85. This is a very sparkly holiday set, with a glittery brush stand to hold the 6 brushes: blush brush, pointed foundation brush, blending brush, pointed concealer brush, allover shadow brush and a lip brush. Now, this set would leave you with a very simple makeup face, but it sounds great for a teenager, who shouldn’t be overdoing it anyway. Paired with Sephora’s Precious Elements Traincase, this would make you a winner of a BFF for the holidays … Although the case isn’t cheap, $110 for the L and $145 for the XL. In closing, the Glitter Happy Brush set is very similar to the Real Techniques Bold Metals brushes, but the Sephora set gets better reviews for quality. So, there you go. 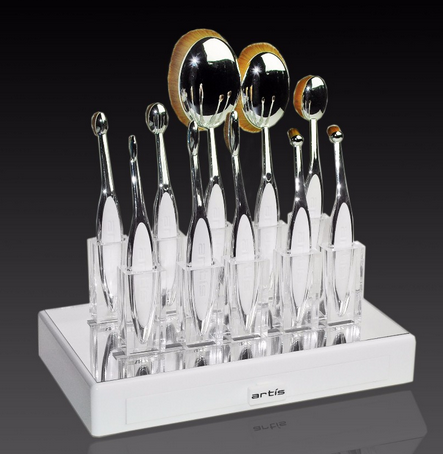 At Target, we have the Sonia Kashuk Limited Edition Facet-nating 10pc Brush Set for $39.99. Made from goat hair, which appears to be bleached. Using history as a guide, this is probably an awesome value. Sonia’s brushes have proven to be decent quality and a very affordable price, and they are described in the reviews as sturdy and soft. They’ve added this $50 palette system, shown in the video below, addition to a unique brush holder system ($190!) shown to the left here. And they’ve also added a new brush size, the Oval 7, which proclaims to be the most perfect-est face brush ever. It’s also $55. Below is a video on the new palette system now sold as an accessory. This is strictly a dressing table luxury, and it was sort of needed with this brush line as these larger brush heads don’t always do so well dipping into a compact.